One keeps hearing about freelancing and its associated risks as well as benefits all the time. All of us would certainly know of someone or the other who is either a freelancer by choice or by default. Perhaps some of us have even gone through a phase where one has ended up freelancing just to get an idea of what it is all about. I have had my own tryst with freelancing, a journey which even led to this platform called MAM (Mad About Moviez) being set up in the process. In my case it all began when I was bored with my regular corporate job and contemplating how to go about plunging full-fledged into my area of passion. Yes there have been ups and downs in the process, often even questioning my sanity and my decision but the persistence has really helped. No, this is not a post on my freelancing journey or anything thereabout, but pardon my indulgence as I couldn’t but help taking an inward look while watching Sandeep Mohan’s Shreelancer. Often freelancers are impulsive; yes they crave for financial independence and not having to be worried about paying their bills. But at the same time they like the fact that they can work on their terms (or so they believeJ) and at their convenience. Depending on one’s individual working style and pattern, one can go about planning your routine, that’s something that we get to initially see in Shreelancer. Shreepad Naik (Arjun Radhakrishnan) is an engineer living in Bangalore along with his father (Salmin Sheriff) who is a retired professional. Shree’s mother is no more and perhaps that’s another reason for the father-son bond to be a little special. Shree is a freelance copy writer, believing in the maxim that he would write on just about anything as long as it pays. Working out of cafes and chasing his clients for his pending payments is a routine, naturally his father prefers to see him take up a regular engineering job and settle down instead. Just when Sree starts to seriously consider his father’s suggestion, he receives an invitation from his close friend of college days to attend his wedding in Chandigarh. Not only is his friend sponsoring his trip but he is also tempted with a small paid assignment, the task of designing the menu for a café in Dehradun to be set up by people known to his friend. And though a little reluctant at first Shree does land up at Chandigarh, little does he know that this would be a life changing journey of sorts. What happens in Chandigarh and how that goes on to impact Shree’s life is what the bulk of the tale is all about. Sandeep Mohan’s writing gives the feel of a languid flow going by the way the proceedings unfurl on screen-there is no tearing hurry to convey anything and we get to slowly but surely become a part of the happenings on screen. If you’ve seen Sandeep’s previous films (Love Wrinkle Free and Hola Venky) then you would know that he does have a knack for comedy, here too this is visible in the first half. With the turn of events post his visit to Chandigarh Shree goes on not just to travel to never before seen locations, he also gets exposed to situations which he would probably have never imagined. There’s this scene in the first half where someone in a client’s office is seen expressing great joy on seeing a photograph of a picturesque place in North India online. But Shree tries to shrug it off by casually saying that the image is perhaps photoshopped and not genuine. Cut to a brief moment in the second half of the film where he realizes how wrong he was all along and that the place in question actually exists. This is conveyed rather subtly and that makes one relate to the realization pretty well. After all haven’t we perhaps also at some point of time been guilty of the same i.e. being quick to form an opinion on something without perhaps even proper exposure to the subject? The budget constraints are visible of course but despite that it’s good to see the way Sandeep has managed to work well within the boundaries and yet come up with an output that is worthy of the big screen. The film also boasts of some pretty good music, despite being an indie film in every sense it does have a few noteworthy songs (composed by Ankur Tewari, Prateek Kuhad, Andrew Sloman and Natalie Matos). One can of course question the near life threatening experiences that Shree goes through and also the way he manages to extricate himself out of the same, there is a feeling of the situations appearing a little too convenient at times. However what is clear is that it is the journey and the experiences that he goes through that actually goes on to give Shree a sense of direction eventually. In true indie fashion as well as keeping the cosmopolitan nature of the characters, the film is in English and Hindi, with a smattering of Marathi (the dialogues between Shree and his father) and Kannada too, the dialogues appear to be improvised as well. Both Arjun Radhakrishnan and Salmin Sheriff do well as Shree and his father respectively, the former appearing convincing as the 28 year old engineer who enjoys freelance writing more than technology and the latter as the father who is old fashioned and yet willing to stay abreast of the contemporary stuff. As the film ends it wouldn’t be a surprise to find yourself pondering over a few things, it could be about whether you relate to the tale or not, or if you found any element of narration to be a little too questionable or convenient. Or it could be something that surprises you actually and that is also welcome isn’t it? 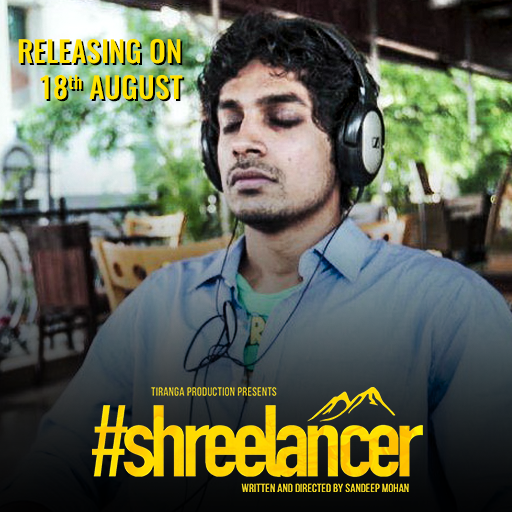 In a way Shreelancer may not be a completely convincing film but it is a genuine attempt by Sandeep Mohan to internalize and explore his influences and experiences of sorts on screen. And for that reason alone if not more the film certainly can do with all the support possible. Note: Shreelancer is currently playing in select screens across various cities Pan India. Love Is A Sour Emotion….